Planning a fence for privacy, aesthetics, or to mark a boundary is straightforward if you layout the fence correctly and know the basic steps to follow. We’ll guide you through the process from start-to-finish to make sure your fence layout and finished product is a success. Check for utilities – It’s important to make sure you know the position of all underground utilities before you start digging holes for fence posts. This is federally mandated and compulsory in most states (if not all). Moreover, you’ll protect yourself from personal injury or service interruptions. The standard approach in urban and suburban areas is to call “Miss Utility” (a free service) on One Call 811. When you call 811 they open a “dig ticket” that alerts all utility companies, servicing your property, of your intention to dig. You’ll need to call 811 a few days before you intend to start work, so utility companies have time to come out and mark the position of underground utilities. Check your property lines – Make sure you know where your property lines are located relative to your proposed fence layout. Installing a fence on the wrong side of a property line could be a costly mistake. 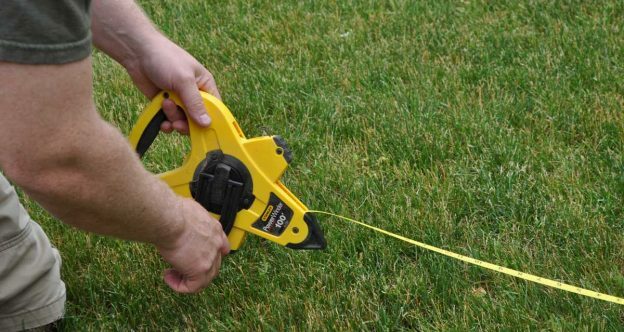 Learn more about how to find your property lines. Create a paper plan – Sketch your intended fence out on paper before you start digging for fence posts. This will give you a visual guide and help in the event you need to change your plan due to an unforeseen problem. Even if you “know” where all utilities are when you start digging for fence posts, always be cautious. 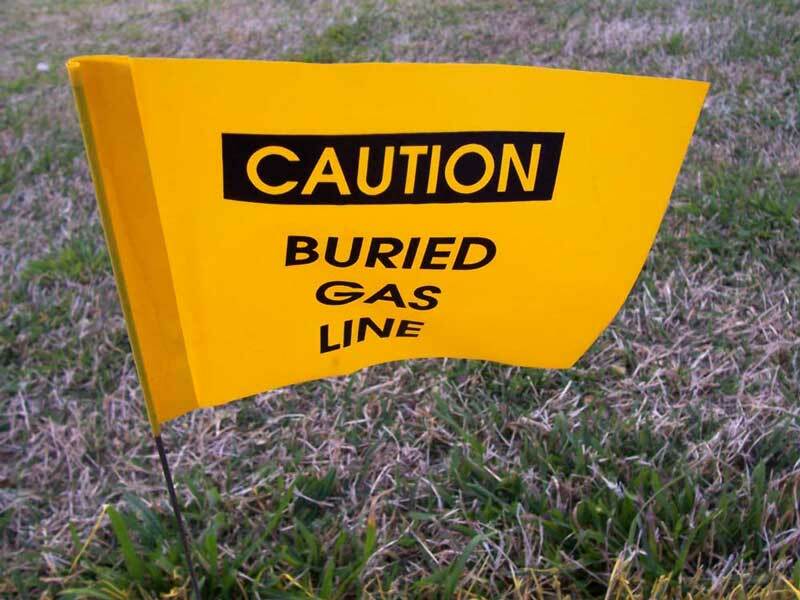 For example, there may be a gas line buried on or near your property line, this is fairly common. That said, the exact placement may be inaccurate to the tune of a few feet either way. In this situation, it’s a good idea to carefully hand dig to ascertain the exact path the gas line takes and how it impacts on your fence layout. Normally, you’re recommended to avoid a gas line by 2 feet, but check with your gas company to make sure. 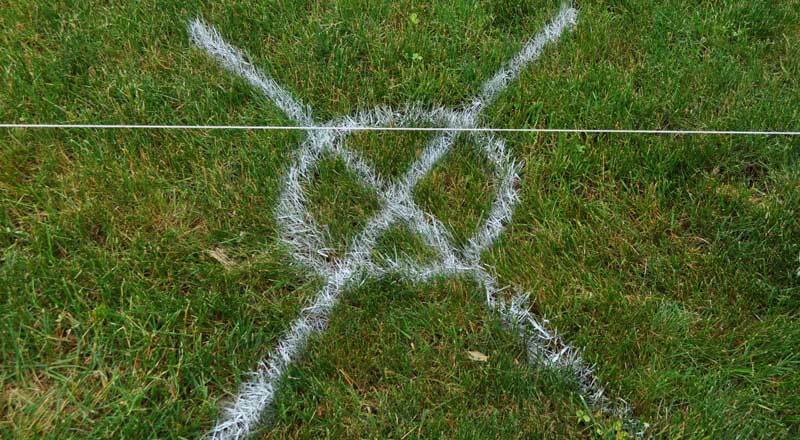 Once you’ve worked out the safe placement of your fence, it’s time to start marking out. 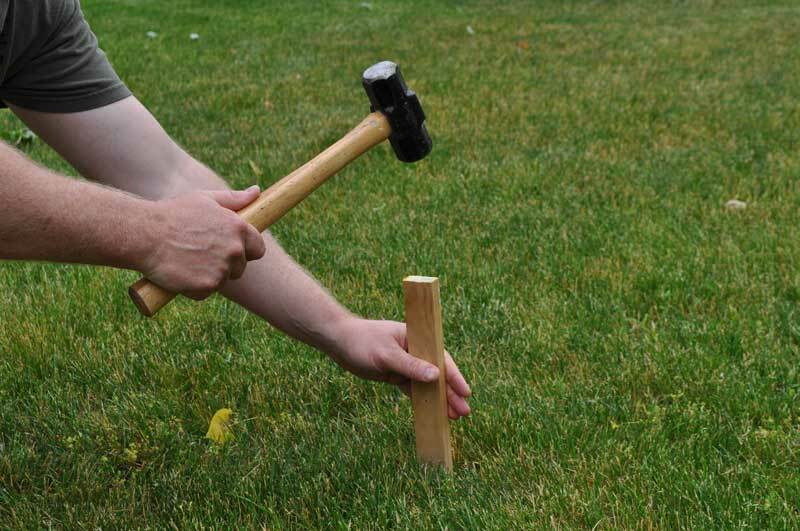 The first thing to do is drive a metal or wooden peg in the ground at the location of your first corner; this will be the starting point for your fence. 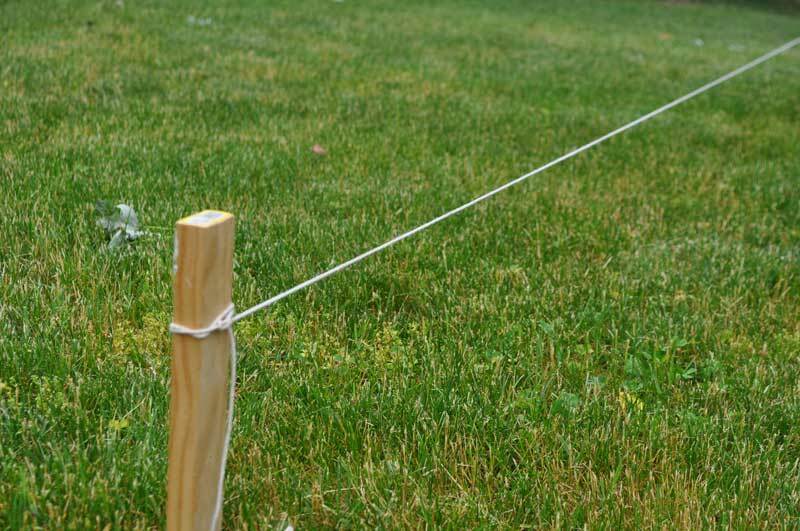 Take a string line from your corner peg and lay out the first side of fencing, fixing the line with a metal peg at the end. The next step is to get a perfectly square (right angle) string for the adjoining run of fencing. Here’s how. 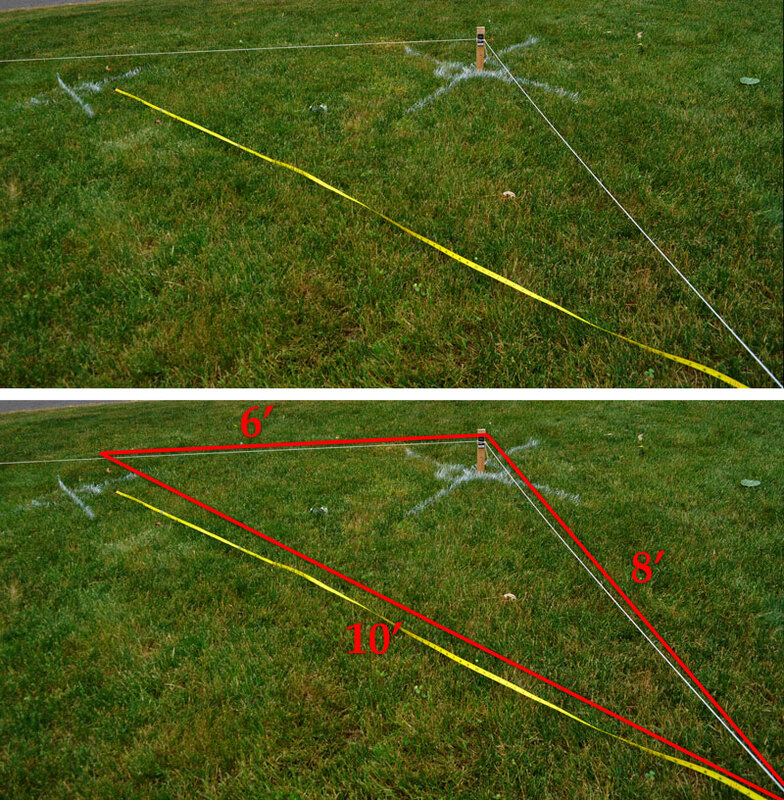 To make sure you have a 90-degree angle at corners and your fence layout is square, you’ll need to do a little math. 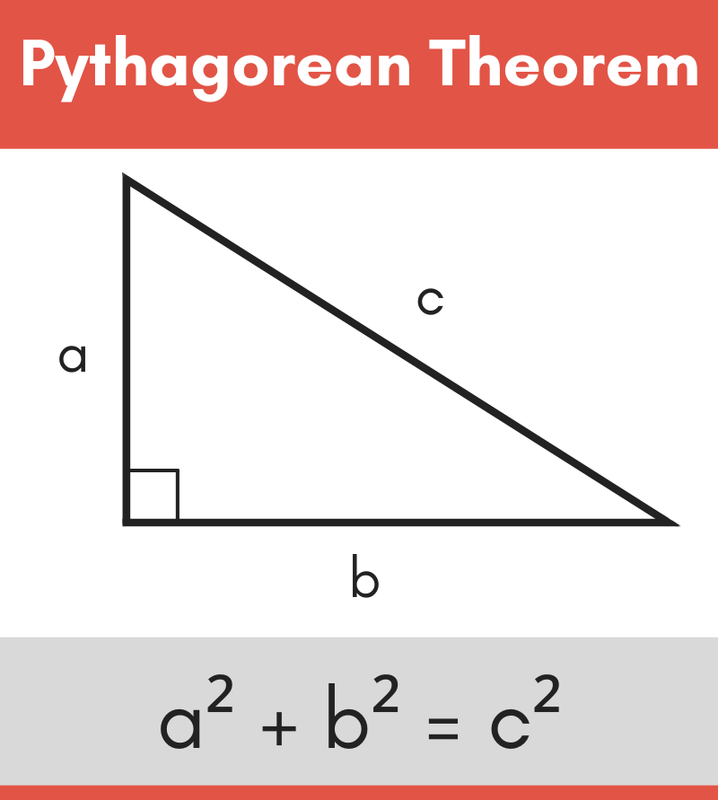 Using the Pythagorean Theorem, based on a 3,4,5 triangle, it’s possible to work out a perfect right angle. In the diagram above, your corner starting peg is located bottom right of the triangle and side a represents the string you fixed for your first line of fencing. We know that in a 3,4,5 triangle, side a would be 3 units, side b would be 4 units and side c would be 5 units i.e. 32 =9, 42=16 and 9+16=25 or c2. For a line of fence that is longer, you simply use multiples of 3,4,5 e.g. 6,8,10 and 9,12,15 etc. Assuming you’re using, 6,8,10 – measure out 6 feet on your fixed string a and drive in a second peg. Next, you’ll need two tape measures. Set the first tape measure to 8 feet and hook it to your corner starting peg. This represents side b in our diagram above. Set the second tape measure to 10 feet (side c) and hook it to the peg you drove in at 6 feet on your fixed line a.
Swivel the tape measures till the 8-foot mark on your side b measure and the 10-foot mark on your side c measure line up. Drive in a third peg to mark the spot. You’ve now created a perfectly square corner. Continue till you’ve completed your fence layout. Tip: Remember, standard fence panels come in 6 or 8 feet lengths. Take this into consideration when laying out your fence if you plan to use standard panels. Please refer to our fence calculator or vinyl fence calculator for more help with this. Once you’ve marked out the fence line, you’ll need to set out a second set of strings parallel but 3 feet out from the first set. This is because the first set will be in the way when you begin to dig holes for the fence posts. Once you’ve marked out the locations for the fence posts on the inside strings, you’ll remove them and use the strings set at 3 feet for reference and measuring. If your wooden fence is to be custom made to fit a specific run length, you’ll have to work out your fence post centers. Bear in mind that standard panels are normally 6 feet (72 inches) or 8 feet (96 inches) in length, so it’s a good idea to aim for panels on, or between these two dimensions. Let’s say you have a run of 100 feet or 1200 inches. 1200/72 = 16.66 and 1200/96 = 12.5. So, in this case you might decide on 15 panels for the run. The number of fence posts you need will be 15 + 1 extra for the end of the run = 16. Standard 4×4 fence posts are normally 3 1/2 inches wide, which is important when calculating the center of the fence posts. To find the distance between each post center, subtract the width of the post (3 1/2″) from the length of the fence (1200″), which would result in 1196 1/2″ in our example. Divide this number by the number of panels to find the distance between the post centers. Each end post center should be 1/2 that width from the edge of the end of the fence so that the edge of the end posts meet the end of the fence line (see diagram above). Different fence styles may require a slightly different post layout, so always consider the style of fence you’re installing when locating your posts and be sure that the layout will work with your chosen style. You can work out centers for pre-made standard wooden fences and vinyl fences using the same principles for the fence layout. Our fence calculator can layout your post centers as well. In the example above, using a spray can, mark out a large “X” on the inner string line. Make sure the “X” extends beyond the hole you need to dig so you can use it for reference. Next mark out the position of the other holes in the same way. When marking out is complete, you can remove the inner string lines and use the outer string as a guide. To make sure your fence is perfectly straight, dig the two end holes of one side of the fence first, drop in fence posts and make sure they’re plumb before setting them in place. Drive screws in the posts, roughly 6 inches off the ground, and leave the heads protruding half an inch. Tie a string tightly between them. Use the string as a guide when you backfill and set subsequent poles. With a little bit of forethought and planning, you can lay your fence out safely and efficiently. You can maximize your yard space, and add an asset that will increase the aesthetics and value of your home. Next Step – After layout is complete it’s time to start the installation. Learn how to install a wood privacy fence, including how to set the posts and attach the rails and pickets.